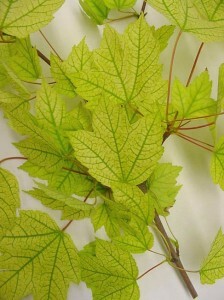 CHLOROSIS is the general term for yellow discoloration of leaves that should be green. It is caused by a deficiency of chlorophyll, usually because of nutrient deficiency. Some trees cannot extract vital micronutrients from the soil if the soil is too alkaline. 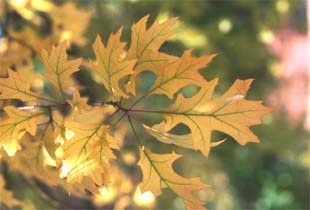 RIVER BIRCHES AND PIN OAKS often show yellowing of foliage and in severe cases some scorch of leaf edges due to iron deficiency. This is usually due to inability of the tree to take up iron from the soil surrounding the roots, not necessarily due to lack of iron in the soil, but because the pH of the soil is too high (the soil is alkaline or "sweet"). Although many native pin oaks seem to do well, those that are planted as ornamentals into suburban, clay heavy soils, often do poorly. River birches that are planted in poorly drained soils with significant clay content often exhibit chlorosis, sometimes severe with leaves stunted in size and with scorched margins. RED MAPLES (that is, the species red maple, with green leaves in summer and red fall coloration) often show yellowing, stunting, browning and scorch of their leaves due to alkaline soil, but in this case the problem is usually manganese deficiency. Again, these are often red maples planted into suburban soils with high clay content and high pH. OTHER TREES may show yellowing for various reasons but nutrient deficiency must be considered. The primary problem when trees are chlorotic is the soil pH being too high. It can be very difficult to change the pH of a large amount of soil around a tree's roots. Granular sulfur can be applied to the surface of the soil under the tree to help with lowering the pH of the soil surrounding the roots. Surface applied products can best be applied on or under a natural bark mulch bed at the base of the tree. A common recommendation is to spread one pound of sulfur per 100 square feet twice per year. Acidifying fertilizers and chelated iron or manganese can be injected into the soil. MICRONUTRIENTS (iron, manganese) can be injected directly into the tree's vascular system to give temporary (one to three years) improvement of leaf color and function. These infusions are usually done in September. We usually use a combination of methods to try to achieve improvement of the color and function of the leaves, thus improving both the beauty and health of the tree.